The city administration of Buenos Aires pushes a wave of street constructions and renovations since last spring. Everywhere in the city, construction sites are shooting up like mushrooms. These guys are working on the revitalization of Defensa Street in San Telmo. They replace old pipes and repair the sewer system in general. Well, then. Haciendo Buenos Aires! I think the renovations are wonderful, if, perhaps, a bit constraining...they provide jobs, too, which is good for the economy! No one thinks about sewer pipes, until they back up. Then, they're all you think about. Revitalization is good! Infrastructure work provides good jobs and is necessary as the other commenters have noted above. Give Defensa Street a few weeks to heal its wounds - and it'll be fine. Sounds like it will be worth the inconvenience. A few weeks? (-; These guys are working very thoroughly and carefully. I suppose one could say "slowly" but good things need their time. 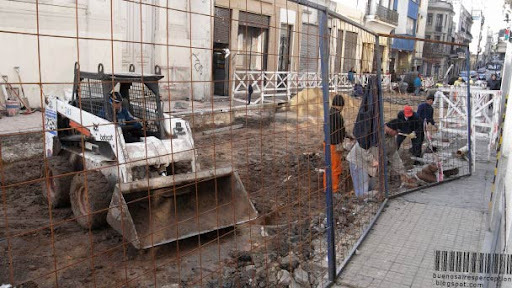 The sections of Defensa Street in San Telmo and Montserrat are under construction for several months now. Good to see. Replacing, repairing, renovating... not always fancy but absolutely necessary for a city to stay vital.